Biography of French Plein-Air Landscape Painter. Jean-Baptiste-Camille Corot was one of the great exponents of 19th century French landscape painting. Although he produced a number of fine portraits, figure paintings, and etchings - all much neglected aspects of his art - he is best known for the luminous clarity of his plein-air painting. A huge influence on his contemporaries as well as later artists, including the great Swiss painter Ferdinand Hodler (1853-1918), Corot's poetic style of unaffected naturalism bridged the gap between the romantic Arcadian tradition of Neoclassical art and the plein-air purity of French Impressionism. He remains one of the world's most popular and most famous painters. It is three o'clock in the morning. The sun is not yet up. The painter sits under a tree. He is short, thickset, alert, with a strong furrowed face, a humorous twinkle in his eyes, a protruding lower lip, wrists and muscles of steel and the heart of a child. He looks upon the gray sheet of the dawn, and he sings. Simple, unaffected, joyous at the very thought of being alive, he sings like the birds to the coming day. He sings, and he waits. In the gray mist the vague outlines of things can barely be seen. There is a faint perfume in the air. The little thin grasses tremble in the breeze. And then, the first rays of the sun! The flowers awaken, each with its trembling dewdrop. The birds, still invisible in their forest cathedral, burst into their morning hymn. The fog rises, like the curtain upon a new play, revealing the blade of the silver river, the trees, the cottages and the delicately tinted sky overhead. The scene is now spread out before the painter's eyes. And now the sun is up. The heavens are ablaze. But the light upon the earth is still pale and caressing. At the end of the field a peasant with his cart and his oxen. The tinkle of the sheep bell. A traveller upon a dapple horse rises over the brow of the hill and then disappears in the hollow. White birches, green grass, blue air-fresh, delicate, alive. And the artist, still singing, is painting it all. It is noontime. The sun has kindled the world. The air is heavy, drowsy, still. The flowers bend their heads. The birds are hushed. Only a single sound is heard - the hammer of the blacksmith in the village. Ding! Ding! How rhythmically it beats upon the anvil! And now the hammer is silent. The hour of rest. The painter goes to his lunch at the farm. A thick slice of bread and butter, cheese, eggs, ham. Ah, but it tastes good! And then, after this wholesome lunch, a brief nap. He dreams of his paintings. Later on he will paint his dreams. The sun is marching toward the horizon. The air vibrates, as if shattered by the distant beat of a tom-tom. To work again! The selfsame landscape in a different mood, seen under a different light. What a change of features, of contours, of shades, of harmonies - of thoughts. For, under the brush of this magician, the landscape talks and thinks. And now the sun is sinking in the west. It goes down in a splash of yellow, orange, scarlet, cherry, purple. A pretentious and vulgar display. Not a scene for this artist. For he prefers Nature in her quieter moods. And so he sits down under a poplar and waits. The last ray of the sun is now dipping beyond the horizon. A streak of gold and purple fringing the cloud. Ah, this is more like it! Twilight, tenderness, peace. The sun is gone. The sky is veiled with a tinted vapour of pale yellow, the last reflection of the sun. And now, as the afterglow merges into the night, the sky is a delicate texture of greens and turquoises and grays and browns. The waters of the river reflect the soft tones of the sky. Everything is vague, confused - the breathless moment when the visible melts into the invisible. Nature is drowsy. Sunset, stillness, night. A star dives from the sky into the pond. And the water reflects the light in a ripple of silver smiles. All is darkness except the stars and the pond - a swarm of gold bees reflected in the water. Night, illusion, dreams. Plans for the next day. New landscapes, new colour hues, new secrets of Nature to capture and to interpret upon the canvas. But for today the work is done. Such is a typical day of Corot, the poet painter who succeeded in representing not only the form but the psychology of Nature. Like Bonsels, Corot invested every tree, every flower, every blade of grass with an individual personality and a living soul. The very life of Corot was a gentle poem of generosity and genius. Yet his life began in a stormy period of the world's history. For 1796, the year of his birth, was the transitional period between the tempest of the French Revolution and the tempestuous holocaust of the Napoleonic Wars. He grew up in a generation of blood and thunder, of ambition and intolerance and hatred and dishonesty and revenge. But his character remained untainted by the savage stupidities of his age. For he was fortunate in the wholesome and the friendly environment of his home. His father was a wigmaker, and his mother was a dressmaker - artists after a fashion, and people of splendid souls. They adored their child, and although they disapproved of his "tinkering with the paintbrush," they were tolerant and allowed him to have his way. Shortly before Corot's birth his father had abandoned his wig-making business and had become the manager of his wife's dressmaking establishment in the Rue du Bac, one of the more fashionable districts of Paris. The business prospered, and the father hoped that his son, too, would become a businessman. He sent him through school and college, and then he secured for him a job as a drapery salesman. Corot stuck to his job for six years and then gave it up for his painting. His father made one more attempt to turn the young artist into a merchant. He offered to set him up in a business of his own with a capital of one hundred thousand francs (about twenty thousand dollars). Corot refused this practical offer. He wanted to paint. His mother tried to bring him to his senses. "Mon Dieu, Camille," she exclaimed, "who would have thought that a son of mine would turn out to be so vulgar!" 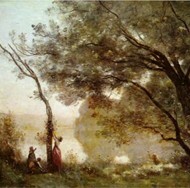 But Corot still persisted in his desire to paint. Whereupon the parents sent him off on his "crazy adventure" with a good-natured shrug of the shoulders and a generous income of twelve hundred francs a year. During these early years (1820s), landscape painting was divided into two schools or styles: the Italianate Neoclassical school of Southern Europe which promoted idealized imaginary views often populated with mythological, or biblical figures; and a more realistic school derived from the Dutch Realist tradition - more popular in England and Northern Europe - which remained faithful to the real nature rather than the idyllic version. In both cases, artists typically began with a few outdoor sketches and preliminary studies, which were then completed in the studio. The English landscape painting school - led by John Constable and J.M.W. Turner - was especially influential in its preference for realism over neoclassicism. Corot studied briefly (18211822) under the painter and teacher Achille-Etna Michallon (1796-1822) and also Jean-Victor Bertin (1767-1842), both of whom had been pupils of Pierre-Henri de Valenciennes (1750-1819) a devotee of Nicolas Poussin, and Claude Lorrain and the classical tradition. Working en plein air in the forests of Fontainebleau and in the villages like Ville-d'Avray to the west of the French capital, as well as in his studio, Corot readily absorbed this classical style in his drawing, sketching and composition, but added his own poetry and unaffected naturalness to his painting. But this poetry was infused with realism - his notebooks reveal copious studies of trees, rocks, and plant forms, demonstrating his focus on the reality of the countryside. During the formative period of his art he paid two visits to Italy to study the techniques used in Renaissance art (c.1400-1530), but - despite his reverence for Leonardo da Vinci - found himself far more absorbed by The Farnese Gardens, the Italian countryside and the beauty of the Italian skies. His first stay in Italy (1825-1828) was a highly productive experience, during which he learned how to use light and shadow to depict the required volume and solidity of buildings, producing 200 drawings and 150 oil paintings in the process. But as he did throughout his life, he acknowledged no other teacher except Nature. He never copied. He always painted direct from life. "Do not follow others," he said. "He who follows is always behind ... You must interpret Nature with entire simplicity and according to your personal sentiment, altogether detaching yourself from what you know of the old masters or of contemporaries. Only in this way will you do work of real feeling." During the late 1820s and early 1830s, Corot concentrated on producing large landscapes for submission to the Paris Salon, whose preference still lay with realist painting in a classical academic style. He began by reworking and expanding his Italian oil sketches to incorporate Neoclassical elements, as in his first submission, View at Narni (1827). This derived from a quick, natural oil sketch of a ruined Roman aqueduct, in dusty bright sun, which he reworked into an idyllic pastoral setting. Although the Salon accepted this work and other submissions from him in 1831 and 1833 (one portrait and several landscapes), the reception accorded his works by the critics was generally cool, so Corot paid two more visits to Italy to develop his style further. The result was his biblical picture Hagar in the Wilderness (1835), depicting Hagar and the child Ishmael saved by an angel from dehydration in the desert. Although derived from another of his Italian studies, the boldness of his composition and painterly method impressed the critics. Despite these ups and downs, Corot went on in his own way, listening to none and befriending all. His father had increased his income to two thousand francs. But Corot spent it all - on others. He was the extravagant brother of all the needy young artists in Paris. He fed them, clothed them and later even bought a house for one of them. To meet these charities - he never called them charities but tokens of his friendships - he was obliged to borrow from his father large sums of money over and above his allowance. "Someday," he said, "I will sell my paintings and then I will repay you." But his father merely opened his purse strings and smiled. Who ever heard of an artist being able to pay money to a businessman? Of what good were artists, anyhow? To the end of his days, he was convinced, Camille would remain a foolish, unpractical and improvident child. Unpractical and improvident, yes - to a certain extent. But foolish? Not Corot. He was wise with the wisdom of a great heart. Frugal to the point of abstemiousness, Corot could be "gay on a loaf of bread," to quote his biographer, Everard Meynell. For his bread was seasoned with the spice of joy at the thought that some other poor 'devil of an artist was at that very moment enjoying a hearty meal at his expense. His greatest pleasure was to lend, without hope of repayment. Corot's pictures were great because they came out of the goodness of his heart. And, little by little, the public grew to understand the greatness of his pictures as well as the goodness of his heart. They began to buy his canvases, and he gave his earnings to his friends. And what friends! There was Charles-Francois Daubigny (1817-78), one of the earliest exponents of plein air painting, who painted and played and jested with him through life and who upon his deathbed whispered, "Adieu. I go to heaven to see if friend Corot has found me subjects for landscapes." There was Henri Rousseau, Le Douanier, (1844-1910) of the massive head and the heavy beard, the artist whose merry face still bore the traces of an early hunger - a hunger to which Corot's generosity had helped to put an end. There was Diaz - Narcisse Virgile Diaz de la Pella (1807-76) - whose richly coloured paintings matched the colourful richness of his name, the man of the crippled leg and the energetic heart, a Spaniard who looked like a pirate and painted like a god, a black-haired John Silver who had begged upon the streets, who was now enjoying the cup of success to the brim and who, upon a tragic day, was to die from snakebite. There was Baudelaire, the apostle of Romanticism whose genius verged upon insanity - or, as some of his more malicious critics would have it, whose insanity verged upon genius. And then there was Gustave Courbet, whose vanity was even greater than his genius. Through the 1840s, Corot strove to overcome his critics and mask his disappointment when his works were rejected by the Salon. But then in 1845, Baudelaire declared Corot to be the foremost member of the "modern school of landscape painting". In 1846, the French government awarded him with the cross of the Légion d'Honneur. "Incredible!" exclaimed his father when he heard of this. Corot himself remained as unaffected by this recognition, as he had been by his earlier failures. It merely enabled him to sell his paintings at will and to fill his purse for the benefit of his friends. In 1848 he was awarded a second-class medal at the Salon, but more and more of his contemporaries, including Eugene Delacroix (1798-1863), began acknowledging his artistic status. In 1848, Corot was elected a member of the Salon and public recognition swiftly followed, greatly enhancing his financial worth. Occasionally, he demanded fairly good prices from patrons and art buyers - one thousand francs, three thousand francs, ten thousand francs. But he generally priced his pictures in accordance with his needs at the moment and not in accordance with their intrinsic merit. On the whole he rather underestimated his worth. He would have been not a little surprised could he have foreseen, when he sold his Lac de Garde for eight hundred francs, that within thirty years this painting would fetch two hundred and thirty-one thousand francs! Throughout the tempest of the Franco-Prussian War he remained calm, attending to his own business of creating beauty, befriending and being befriended. To the end, he continued to support his fellow painters, often intervening to secure them commissions. In 1871, he donated $10,000 to the poor of Paris, then blockaded by the Prussian army. He gave 10,000 francs to the widow of the great Jean-Francois Millet (1814-75), the former leader of the Barbizon school of landscape painting, and purchased a cottage for the poor and almost blind caricaturist, painter and sculptor Honore Daumier. Even the usually caustic Edgar Degas called Corot "an angel who smokes a pipe." Corot himself refused to grow old. He expected, as he said, to reach the age of one hundred and four. He had an insatiable appetite for work. At the age of 77 he still climbed the four flights of stairs to his art studio on the Rue Paradis Poissoniere. In the winter of the following year one of his dearest friends, D'Aligny, died. There was a blizzard during the funeral at the cemetery of Montparnasse. But the old painter, with the snow whipping into his white hair, refused to leave until the end of the ceremony. At last his health began to give way. He still went regularly to his studio - not, however, to paint, but to be among his beloved pictures. "If I only had the strength now!" he said to his friend Robaut. "You have no idea of the things I could paint ... I see what I have never seen before. New tints, new skies, new horizons ... Ah, if I could show you these immense horizons!" Three weeks later, on February 22, 1875, he passed on to these new horizons. "I go on hoping," he said just before he died, "that there will be painting in heaven." He was buried at Père Lachaise cemetary in Paris. 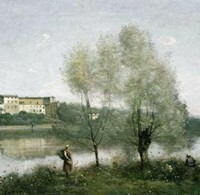 The creator of several famous landscape paintings, Corot's enduring popularity as a landscape artist bears witness to his unique creative ability to represent nature in all its beauty. An important contributor to modern French painting, a wonderful observer of light and clouds, and one of the greatest masters of plein-air oil sketches, he also produced some enchanting figure paintings and portraits (eg. the masterpiece Woman With a Pearl, 1869). He exerted a strong influence on mid-19th century landscape art, including Impressionist landscapes, and on painters including Camille Pissarro (1830-1903, Alfred Sisley (1839-99), Eugène Boudin (1824-98), and Berthe Morisot (1841-95). Let the final word go to Claude Monet (1840-1926), who once declared: "There is only one master here - Corot. We are nothing compared to him, nothing." Works by Corot hang in many of the world's best art museums.